“Sometimes it hurts me because I can’t have a normal job, dress nice and go somewhere nice for work. It hurts me sometimes because I can’t,” Jose Rosario, a trash picker, said. Thursday night in Fishtown. Often late at night, the rattling of cans and bustle of shopping carts can be heard outside. A quick peek out of the window exposes someone, or a few people emptying the recycling bin for cans or other metals onto the sidewalk. After the gut reaction subsides, one is left to wonder: Who are these people? In May 2012, ABCLocal produced a story titled “Truth Behind Trash Pickers,” which drew the connection between trash pickers and litter. At the time that story ran, trash pickers were “a growing nuisance.” Three years later, the same sentiment and stigma remains. “Sometimes it’s embarrassing, sometime[s] it sad. But I have to find my way to live, to find money to eat,” Rosario, 45, said outside Penn Treaty Scrap Yard on Frankford Avenue. Rosario and his stepson, Emmanuel Manduzio Jr., 24, have been picking together for 20 years, and frequent Penn Treaty Scrap yard Friday mornings, earning around 10 cents per pound for cans and air conditioners, between 14 and 18 cents for other recyclables, and hopefully $10 if they can make the weight requirement for steel. Together, they make $40-$50 a day. Solid, well-paying work is hard for the pair, especially Rosario, who has a criminal record. It’s not the focus or the mindset either prescribe to—in many ways they are just happy to survive. “It’s an honest way to make money, staying out of trouble. You are actually helping the community by getting the excess metal and trash and whatever people leave on the ground or throw on the street,” Manduzio said. From Camden, NJ to San Francisco, cities are taking a stand against trash pickers—In fact, in those two places, it’s illegal. In Fishtown, trash picking is common and even expected by long time residents of the neighborhood. But with the increasing amount of people trash picking and fluctuating prices for aluminum and other metals, trash pickers have to work harder to supplement their incomes. Jerry Powell, 61, and Tony Gillardo**, 49, make anywhere from $50-$60 a day on average. “$20 is a bad day,” Powell said. It’s roughly 10PM, the lights are humming under The El by the York-Daulphn station, Powell and Gillardo are beginning their night. On the walk to their starting point, they have already obtained two trash bags filled an eighth of the way with cans, and Gillardo has hidden a barbeque under a safety cone to come back to. “It’s brand new and in the box…it’s crazy,” he said as he removed one of his gloves, a rare commodity in the trash picking world, to wipe his upper lip. “Yeah $11 in 5 minutes,” Powell beamed. Trash picking and odd jobs have become a way of life for Gillardo and Powell, who both have criminal and blue collar backgrounds. Both are full of stories like that—stories that fall upon happenstance. For example, an attorney from New Jersey, son and grandson in tow, hit a pothole on the Girard I-95 exit and got a flat. Gillardo approached and offered to help, and although hesitant at first, the distressed man accepted the help. Powell and Gillardo are proud of, and even amused by the total $34 they made in less than 2 hours that day. The pair frequents Philadelphia Metal and Resource Recovery on Somerset Street, where the prices fluctuate daily, according to David Feinberg, manager of the yard. “We seem to know most of them guys over there, kind of like family after a while,” Powell joked. It’s a challenge to really quantify or measure the effect trash pickers have on the Fishtown or Northern Liberties, be it in a positive or negative way. Visible litter still exists, and noise complaints to the neighborhood associations still occur. Citywide, the ordinance relating to trash picking is §10-400: Noise and Excessive Vibration, which relates to the regulation of noise. In this case for trash pickers, this involves loud speech, any sound 3 decibels above background sound or generally creating a nuisance. Police can issue a Civil Violation Notice to trash pickers for violating these stipulations of the ordinance. Separate from the issue of noise, is the issue of a “mess” left behind. However, in front of or around a residential property is the responsibility of the residing individuals which is confirmed by the Philadelphia’s Property Maintenance Code. Only with sufficient evidence can a CVN can be issued in this case, and would be relatable to a litter charge. In concerns to police calls relating to trash picking, Sgt. John Massi of the 26th District says that those kinds of calls are slim to none. PPD’s efforts in the 26th District have been proactive regarding shopping carts in the sense that they work with grocery stores and other consumer stores, like Home Depot, to prevent theft. Police target individuals pushing a cart that is recognizably from an organization. This effort however depends on patterns and overall police resources. Statewide, Rep. John Taylor would like to create a scrap metal database, to cut down even further. “I wouldn’t say it’s a low priority, but we prioritize it based on manpower and current patterns. We have officers devoted to certain things. I have two bike cops that do Girard Ave from east girard to 8th and Girard and they are strictly proactive handling the shopping carts and the public intoxication, under the influence, things like that,” Sgt. Massi said. Overall, these calls come in four or five times a week, according to Sgt. Massi. To curb these calls, efforts have been made to make and Receiving Stolen Property (RSV) a predominant charge. This charge echoes back to the limited resources the police in the 26th District have because an RSV can quickly turns into a two hour investigation, including booking and later returning the shopping carts. On the other hand, a citation would only take a 20 minute investigation, freeing up that officer. This citation, specifically, is City Ordinance § 10-812. Removal and Abandonment of Shopping Carts. 194, which questions ownership of the cart. “If they are taking trash from vacant lots and streets, that’s a positive. If they are taking it from someone’s waste, the city is going to recycle that. I don’t know if that impacts the city and what they are gaining,” Sgt Massi said. Not a significant amount of time and resources of the 26th District are being spent on the individuals digging through your trash, which translates to less tax dollars for the residents. However, an argument could be made for the effects on recycling revenue made by the city. According to June S. Cantor, Public Relations Specialist for the Streets Department, all revenue generated from recycling goes into the general fund. The two biggest benefactors of this fund—and there are several—are the police and city employee benefits. If trash pickers are rerouting recyclables and the scrap yards aren’t directly recycling with the city, the fund money is lost. Crucial revenue allocated to new police vests or uniforms, or certain insurances for city employees essentially go in the pockets of the pickers. The Philadelphia Revenue department were unable to confirm or deny these impacts. “They can get it easy and go recycle it at one of the scrap yards, I’m all for it. It’s an age-old industry, an age-old cottage industry,” Lara Kelly, the trash and recycling coordinator for the Northern Liberties Neighbors Association, said. The Fishtown Neighborhood Association takes a relaxed stance. “[Trash picking]…isn’t a subject that is brought to our attention very often by the community,” Vice President, Shaun Christopher, said via email. Jordan Rush Esq., FNA’s legal council, did mention complaints about slow moving trucks, as well as a neighborhood desire to see, “their items reused, or given to people less fortunate.” In some aspects, their recycling, or portions of it, are going to those who need help make bills—or even enjoy a fresh pack of cigarettes, or a night at the movies, as Rosario had mentioned. 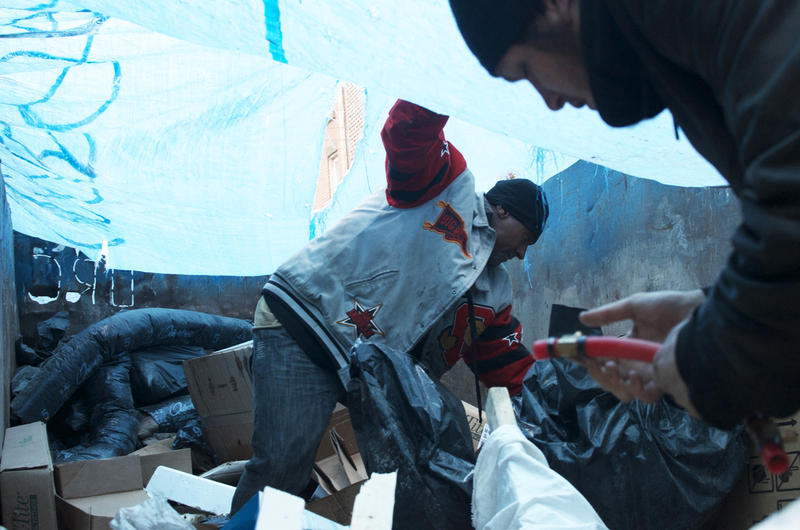 Trash pickers—blue collar workers trying to make ends meet, former criminals or individuals supplementing their Welfare, Social Security or Disability—are becoming more common in Fishtown. They live by the unspoken moral code: Don’t steal, use common courtesy with other pickers, and don’t leave a mess. When stepping back, this seems to be the only time “business as usual” fits the bill. “It’s your pride. We go out and pick and earn our money. We don’t beg for it,” Gillardo said.